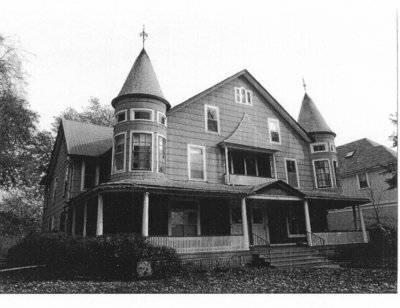 Murderer, Dr. H. H. Holmes (aka Herman W. Mudgett) , built only one house in Wilmette, at what was then 38 N. John Street and was later 726 11th St. [Eleventh Street], between Lake and Central. The house was occupied by Holmes and his wife, Myrta, their daughter, Lucy, and also by Myrta's parents, John and Lucy Belknap, and her brother, John. By all accounts, Holmes spent little time in Wilmette, and was rarely seen around town. In the summer of 1895, after his arrest, reporters converged on the house to try to interview Mrs. Holmes, with little success. Myrta and Lucy Holmes remained in Wilmette for a couple of years after Holmes' trial and execution. Both went on to careers as teachers. A Queen Anne duplex with turrets flanking a central porch, the Holmes house was originally painted dark red. It was torn down in 1997. Here is what the house looked like a few years before its destruction. Information and photograph courtesy of the Wilmette Historical Museum, 609 Ridge Road, Wilmette. The house was later known as The Wilmette Inn and operated as an apartment house.